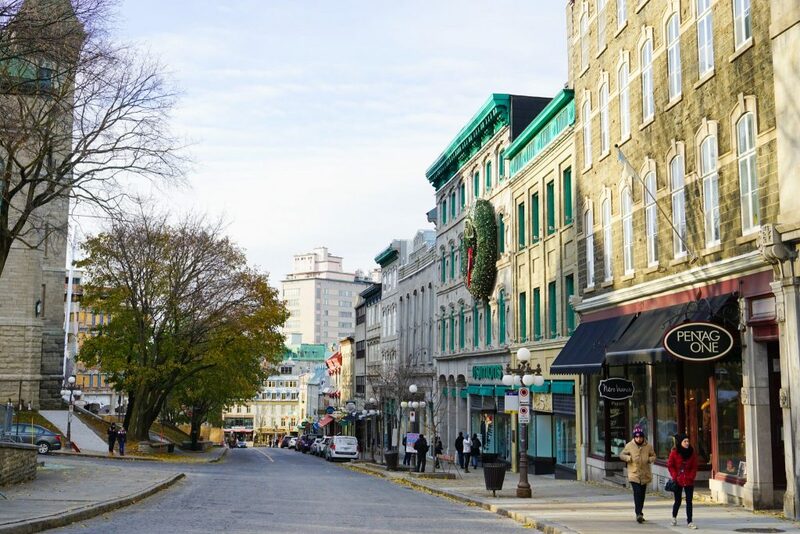 Visiting Quebec City in the fall might just be the perfect time to see this breathtaking city, to walk the historic streets and admire the colonial Nouvelle-France architecture. Quebec City is, of course, perfect to visit at any time of the year – in summer with long days and lively nights, in winter when the city is blanketed in deep snow or spring when the city awakes from it’s slumber invigorated – but in Fall, when the trees turn vivid red and orange and the nights shorten, is perhaps my favourite time to visit. 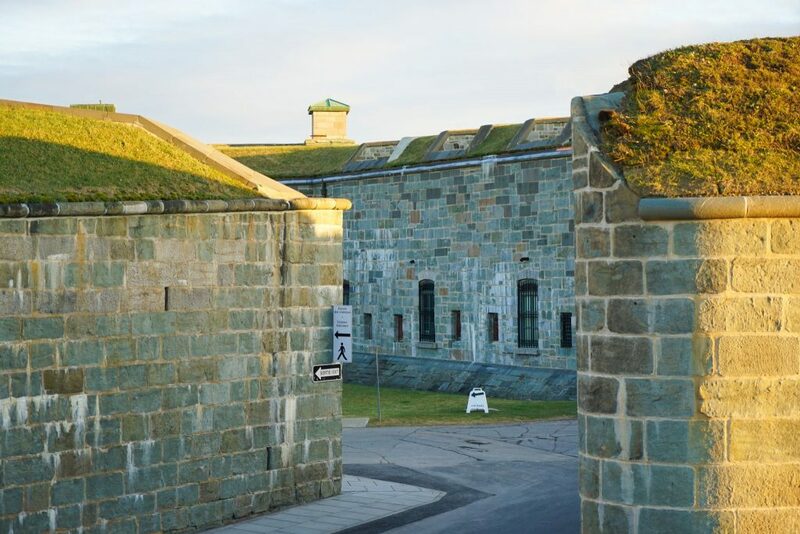 There are just so many beautiful things to do in Quebec City. So many! 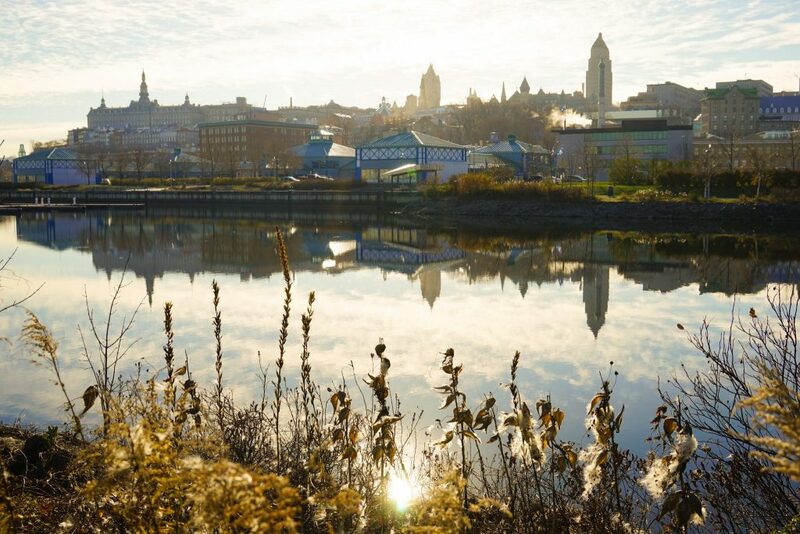 Not only do most tourists avoid this time of year – leaving you with empty streets, off-season rates and plenty of friendly locals who now want to chat with you – but Quebec City in the fall offer’s plenty of events, charm and indeed magic making it the most romantic time to visit. The capital of the Canadian province of Quebec, the Old Town of Quebec is famed not only located on a commanding cliff top position overlooking the St. Lawrence Seaway, but also for being a UNESCO World Heritage Site – and the only city in North America (outside Mexico and the Caribbean) with its original city walls. 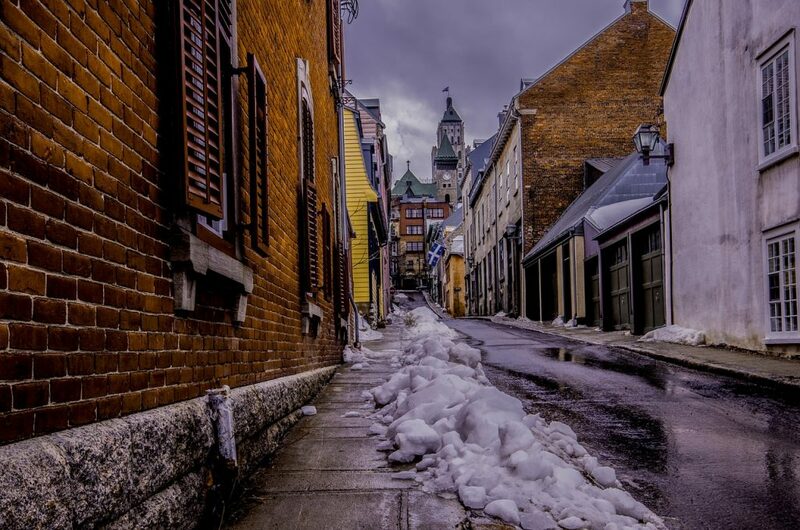 Narrow streets, unique boutiques, ornate decorations, and charming bistros – the lower town district of Petit Champlain has a romantic atmosphere that would put many European villages to shame. The home of the original New France colony, many of the buildings here are original and some, in fact, are still fur trading posts…though more catering to wealthy tourists these days than to send back to France. The charm here is irresistible in the fall as the streets are quiet, decorations are out in full force and the roads are not yet covered in mushy snow. 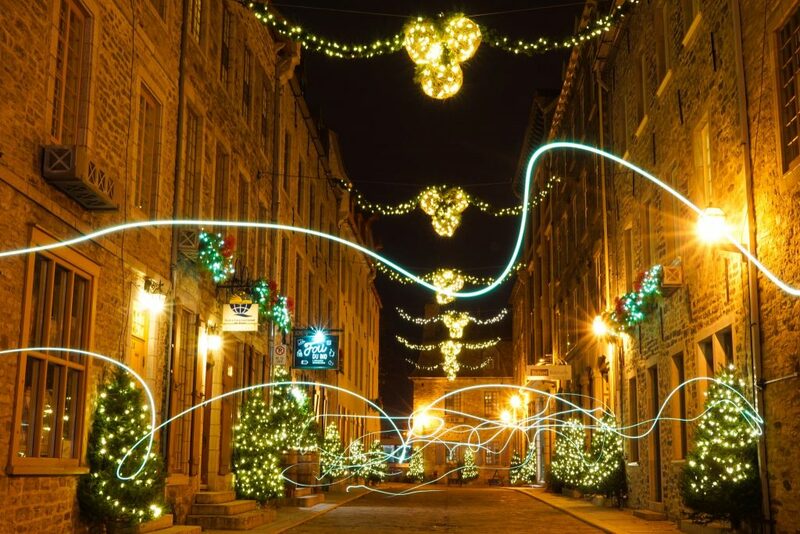 Often named North America’s most beautiful street and a truly marvelous attraction in Quebec City! 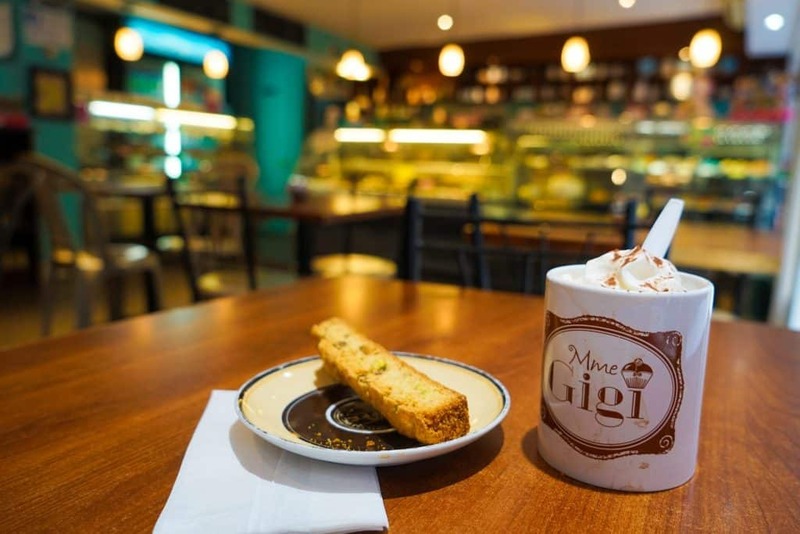 During the fall in Quebec City, the temperatures dips and locals and tourists alike take comfort in rich food and drinks. 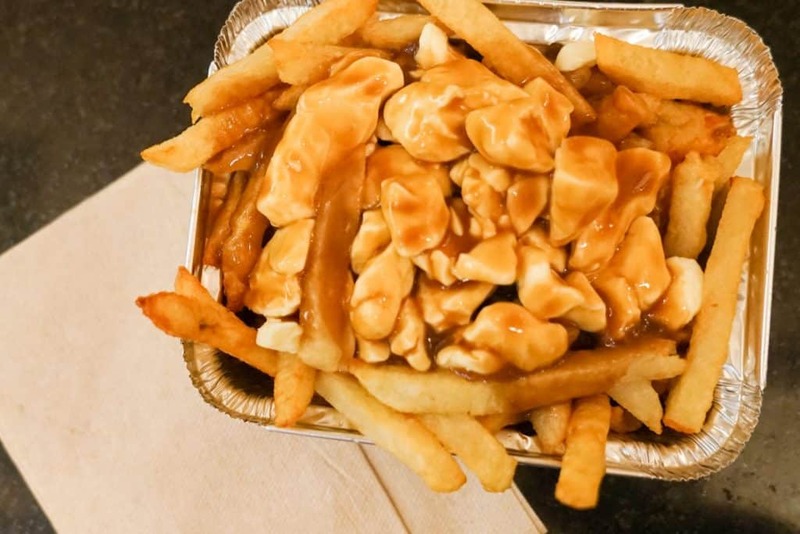 Quebecers are divided by Poutine with some thinking the dish which originates here is a blight on their culture while other’s embrace it as a core part of their identity. Available all over Quebec City from upscale establishments to fast-food locations, Poutine is a food you just cannot miss in Quebec. As is chocolate chaud, but then … when isn’t it perfect for hot chocolate! #3. 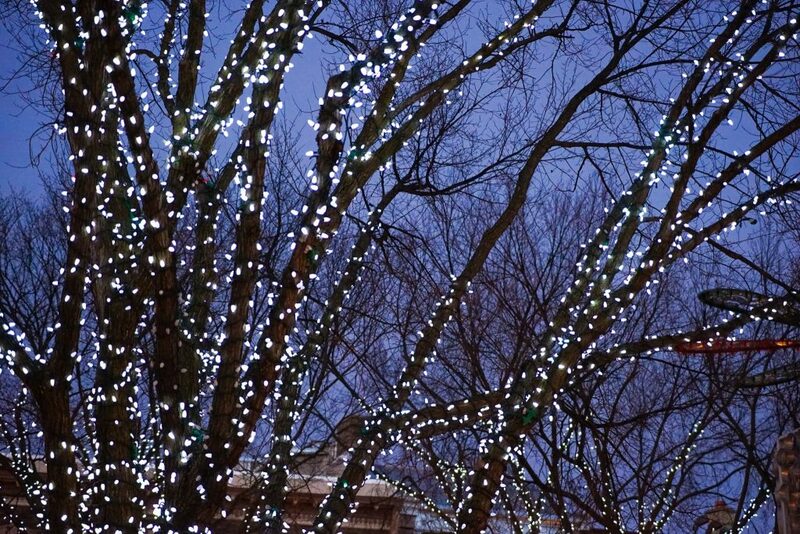 Embrace The Early Quebec City Christmas Spirit! 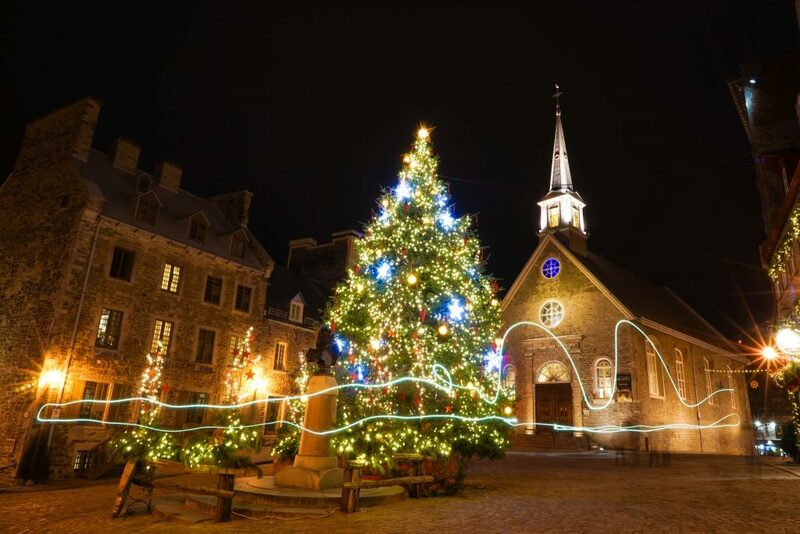 Ok, technically this should come up as a reason to visit Quebec City in the winter – but Quebec City embraces Christmas like no other and as soon as daylight savings ends and the clocks turn back Christmas decorations are swiftly out in full display across the city. Even if you are a bit of a Grinch, it’s hard not to fall in love with the twinkly lights, the scent of Pine in the air and soft French Christmas carols pumping through the silent night air. What’s more, if you visit after November 23rd the annual Quebec City German Christmas Markets are out in the old-town which provide a unique and warm atmosphere with plenty of delicious German treats (such as bratwurst, mulled wine, and gingerbread) in case the delicious French food of Quebec was not enough already! Be careful, however, you might just be tempted to stay all the way through till Christmas. 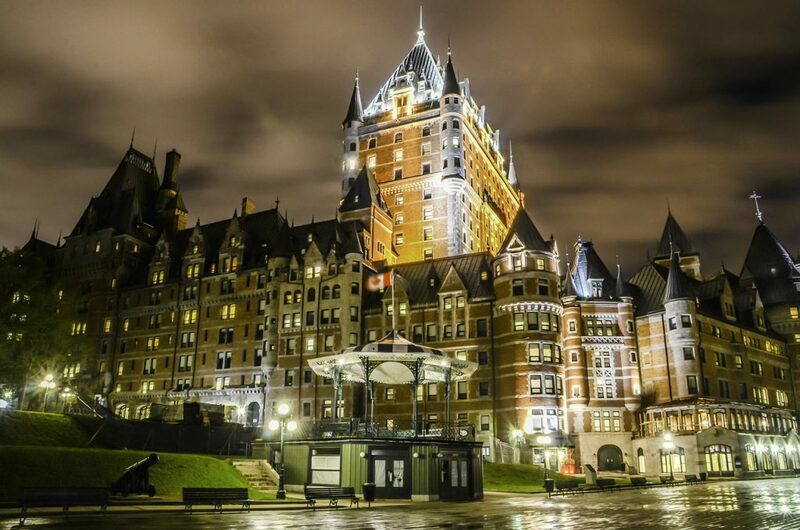 Perfectly located inside the Old Quebec city walls, the iconic Fairmont Château Frontenac is the only answer to the question of where to stay in Quebec City! 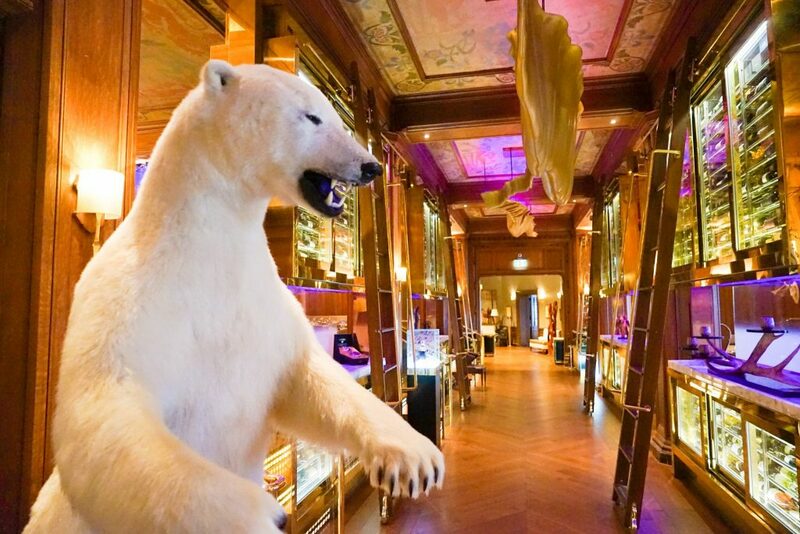 One of the most photographed hotels in the world, a luxury stay at the Hotel Château Frontenac enhances your time in Quebec by continuing the travel experience back to your hotel room with unparalleled views of the historic city and it’s unique architecture. The hotel has a rich and dynamic history complimented by modern innovations, fine dining and a recent multi-million dollar renovation. 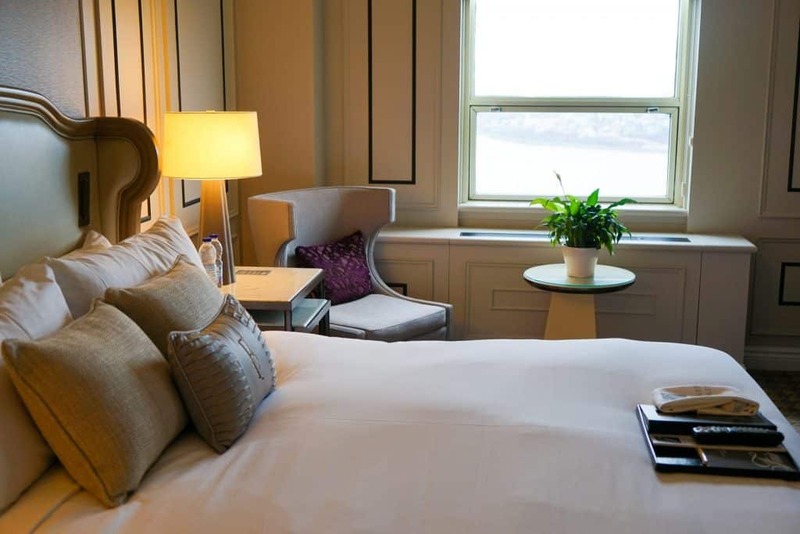 A landmark hotel that is just as much a destination as Quebec city itself, there are 611 guest rooms and suites that sell-out in high season but since you are visiting Quebec City in fall they slash room rates to increase occupancy. 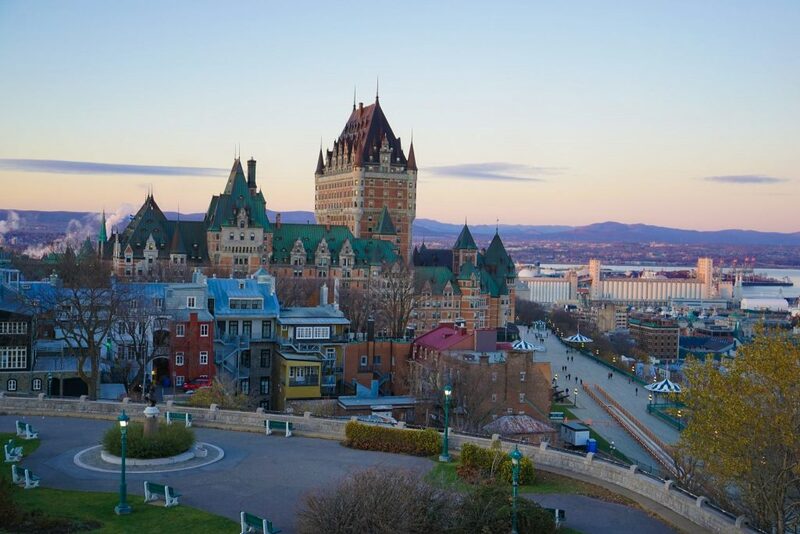 There is never a better (or cheaper) time to stay at the Fairmont Château Frontenac – take a look at their lowest prices and discounted room rates now! 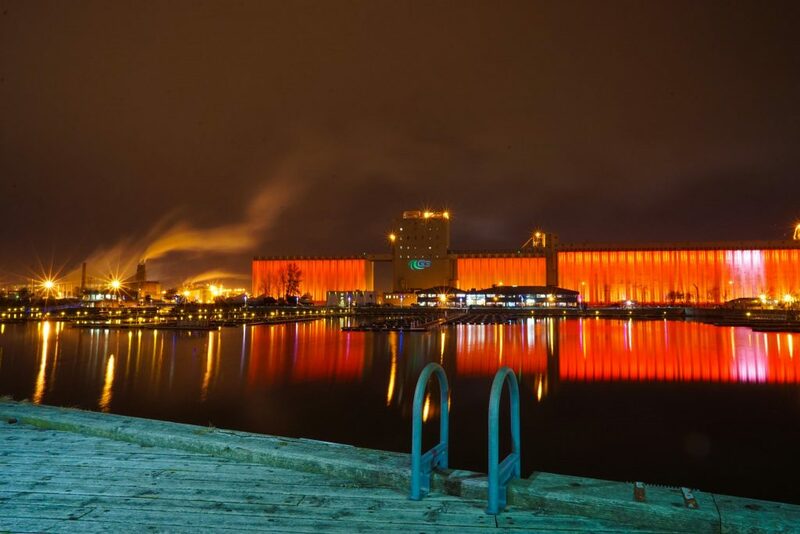 While the boats are all pulled out of the water in anticipation of the coming ice, the fall in Quebec City means it is the perfect time to see the Aurora Borealis permanent lighting installation on the Old Post grain silos. 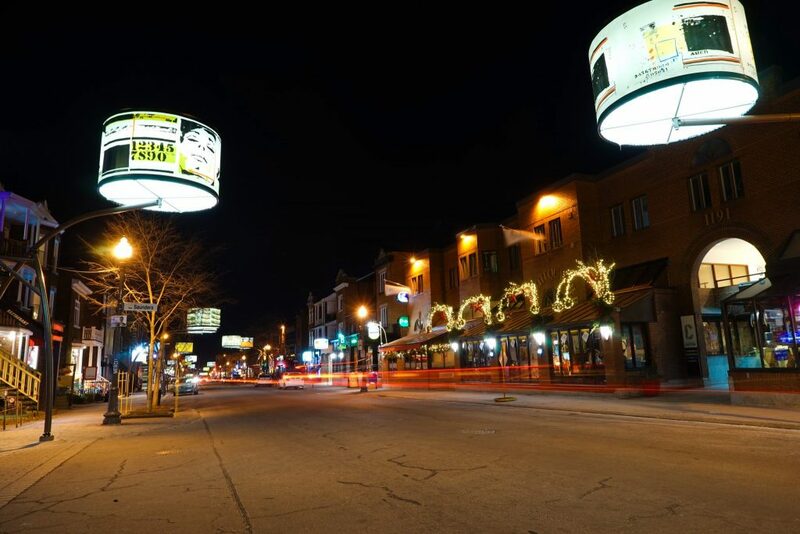 Not quite as good as seeing the Northern Lights in Rovaniemi Lapland…but close! A nightly show inspired by the colors of the northern lights projected on this impressive architectural structure by permanent lighting from sunset until 11.30 pm. 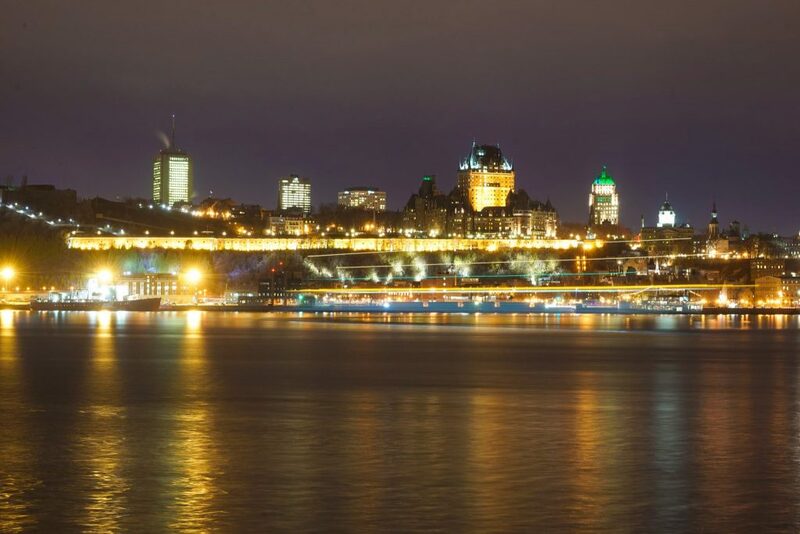 An innovative way to brighten up Quebec City in the darkness, the Old Port of Quebec is also a great place to wander around with a romantic partner (with plenty of spots for stolen kisses) or to appreciate the beautiful view across to the historic Quebec city. 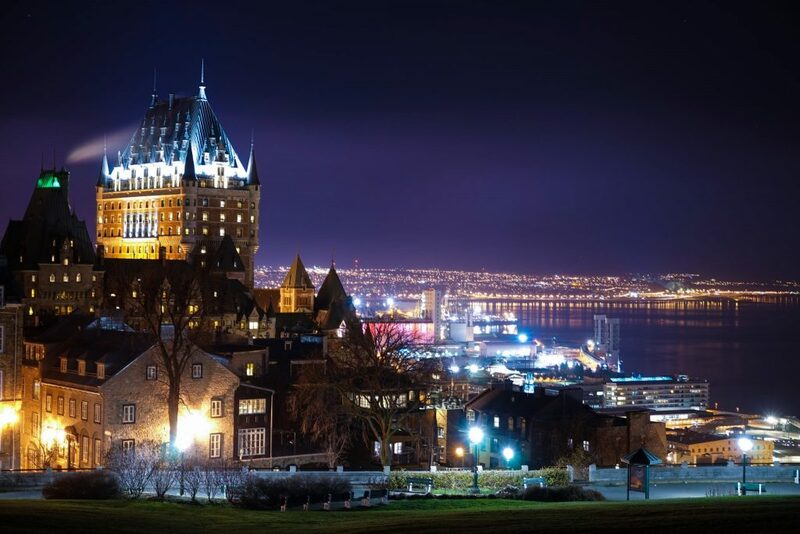 No trip to Quebec City in the Fall would be complete without walking the Governors Promenade, a giant boardwalk reminiscent of a sailing ship of old that connects the Dufferin Terrace in front of Château Frontenac to the Plains of Abraham Park along the cliff-top. 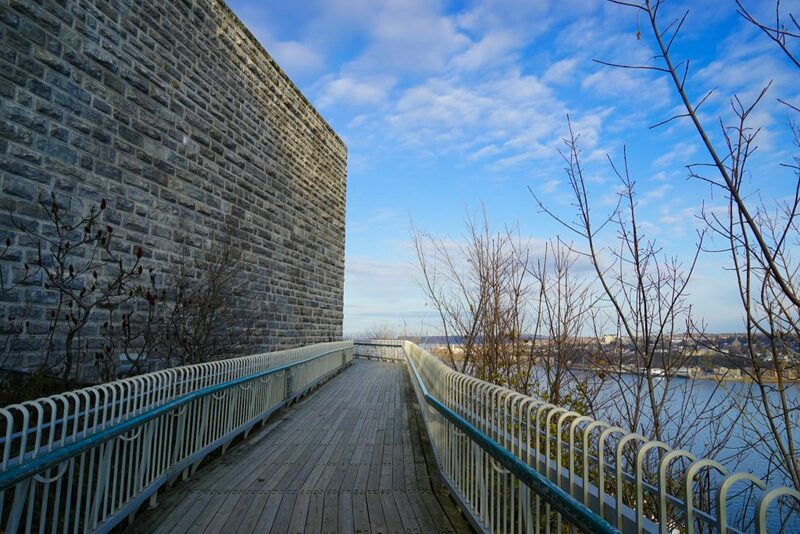 The promenade is elevated above the St. Lawrence River and weaves it’s way around the famed Citadel walls to provide a new panoramic view at every turn while enjoying the fall colors of Quebec City. 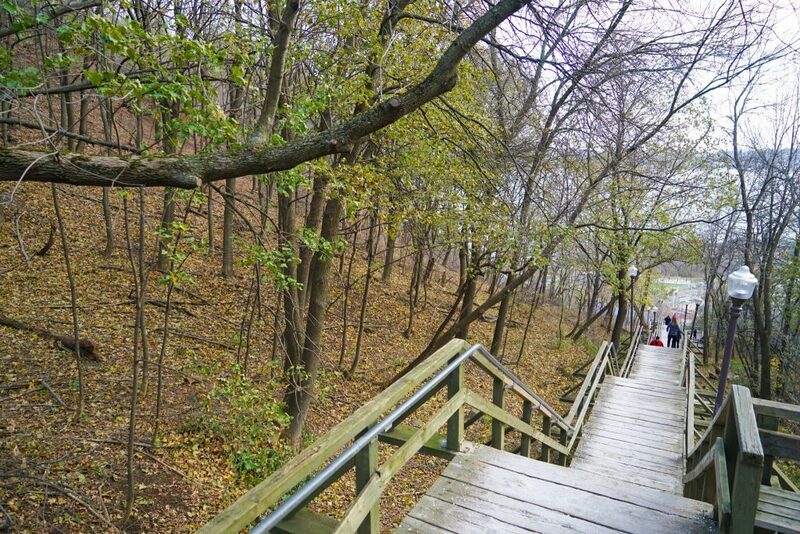 Free, fun and easy – the Quebec City Promenade is the perfect place for a relaxing walk in nature. Be warned however if you’re single this could just as well be called lover’s mile as countless couples can be seen courting here in North America’s most romantic city. 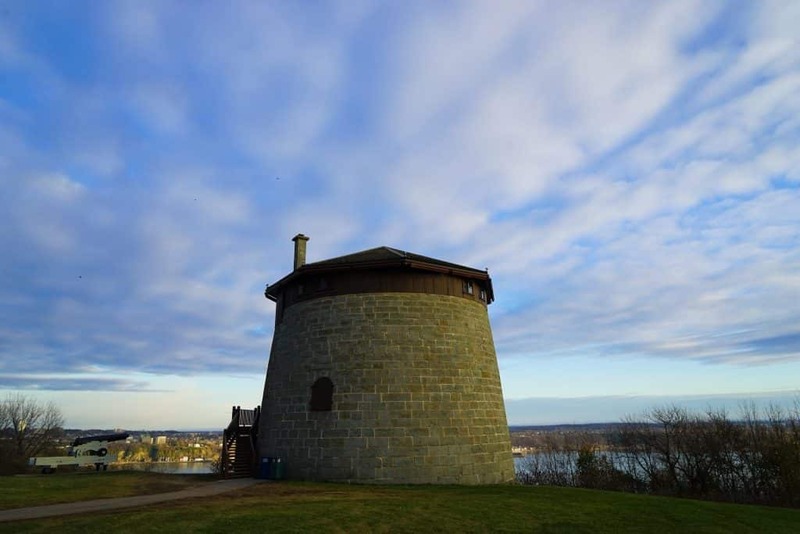 Designated Canada’s first national historic park the Plains of Abraham, part of the National Battlefields Park has been the destination of choice for outdoor recreation in Quebec for over 100 years. The location of the 1759 battle between the French and British Empire, today the park is utterly tranquil and the perfect place to enjoy the fall colors of Quebec in peace. 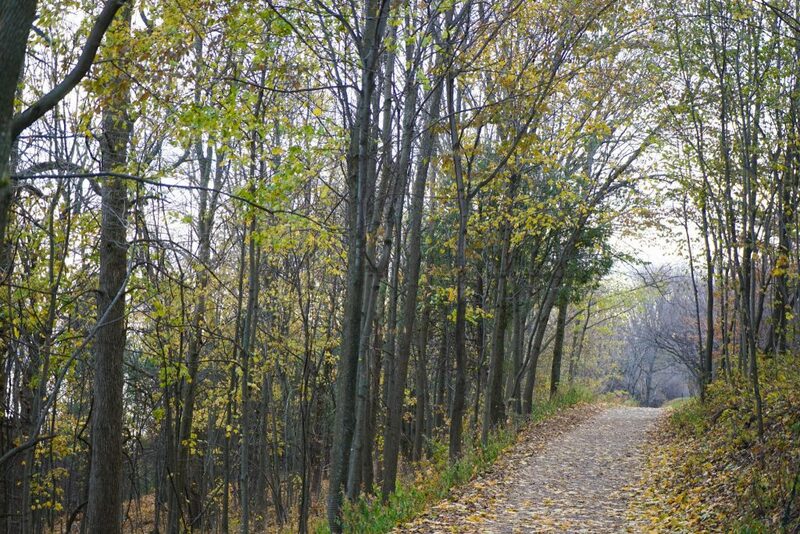 A great place to hike, bike or run – with plenty of paths designed with each in mind, you can see everybody out enjoying this fabulous urban space right on the edge of the old city! One of the oldest streets in Quebec – and a gateway to the city – An amble down Rue Saint-Jean is the perfect way to discover the cities culture and heritage through your taste buds. 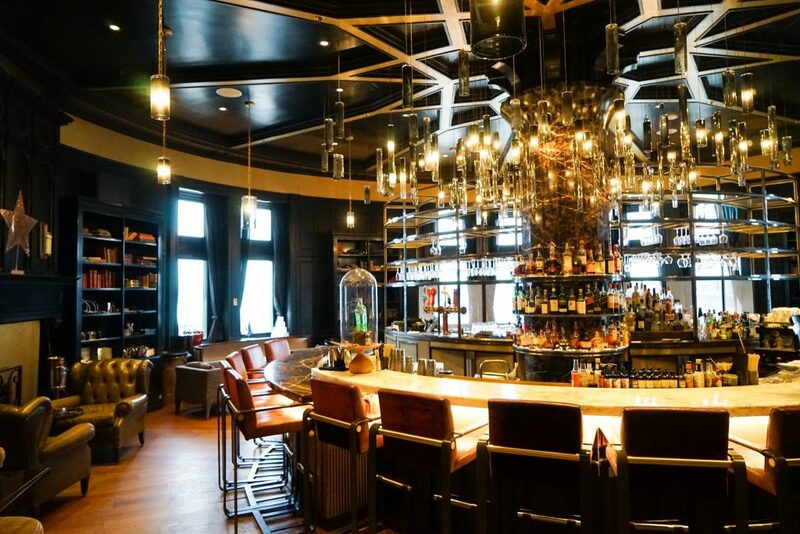 Home to many of the top Quebec city restaurants this is a must on anyone’s itinerary. 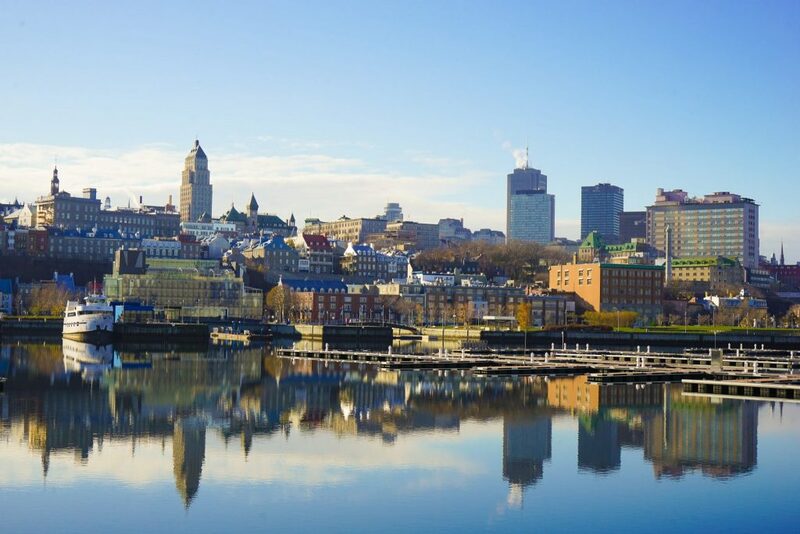 Starting at Notre-Dame de Québec Basilica-Cathedral, the oldest Catholic parish in North America, you will always find something to do on Rue Saint-Jean including interesting shops, pubs, bistros, cafes, concert halls and historic buildings. It’s a long street, with plenty to explore but be sure to stop frequently to escape the fall weather and warm up inside. A unique atmosphere where modern and old Quebec collide, there is never a dull moment here. Quebec City truly has to be one of the most beautiful cities on Earth with its beautiful fusion of modern and new buildings across the cityscape inspired by French, American and British design (at varying times). Fall in Quebec City provides the perfect opportunity for amateur photographers to get those picture-perfect snaps of the old town without tourists. 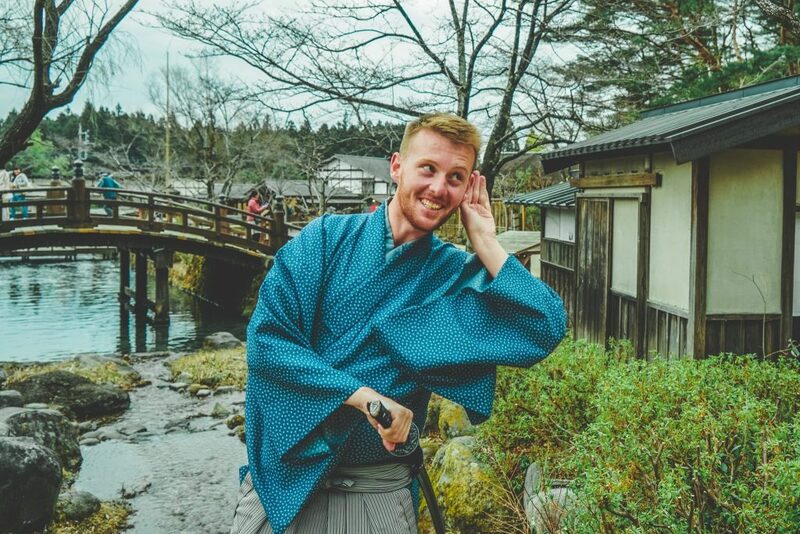 Even those just looking for a perfect Instagram shot will have no issue as the crisp sky, vivid sunsets and beautiful fall colors lend themselves to unforgettable pictures that are sure to make everyone back home jealous. You can take a ferry across the river to Levi for one of the best shots of the city, though for my money the lookout on the edge of the Citadel just behind the old town is the best place to photo’s …especially at sunset. 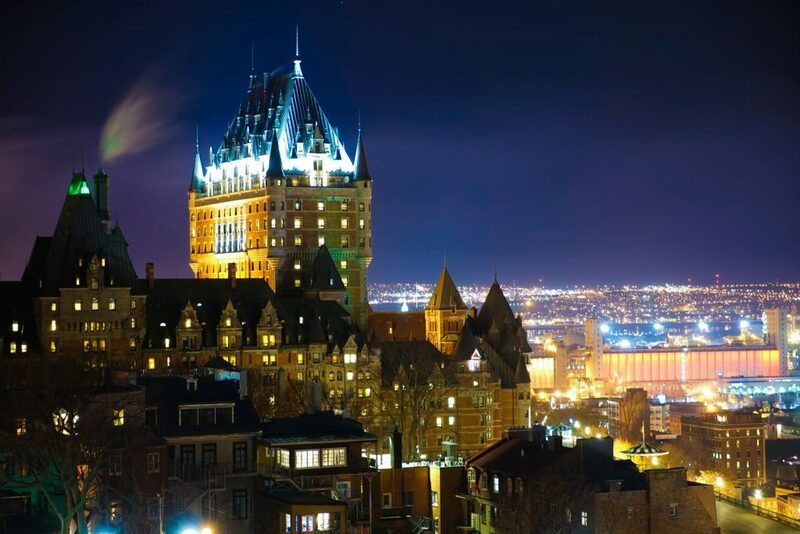 Head up at night (don’t worry Quebec is one of the safest cities in North America) for a romantic spot to view the city lights, stars and, well all of Quebec City! Quebec City is not only beautiful in the fall, but also super full! 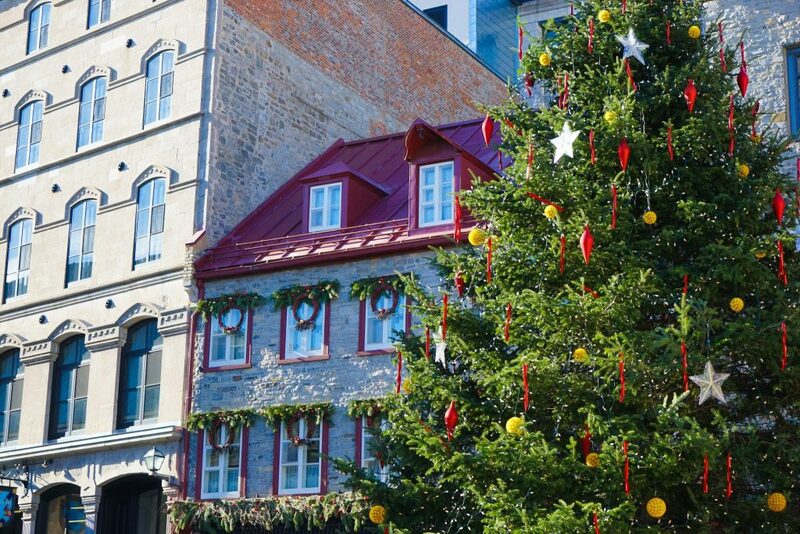 Of course, there are all the events leading up to Quebec City Christmas. 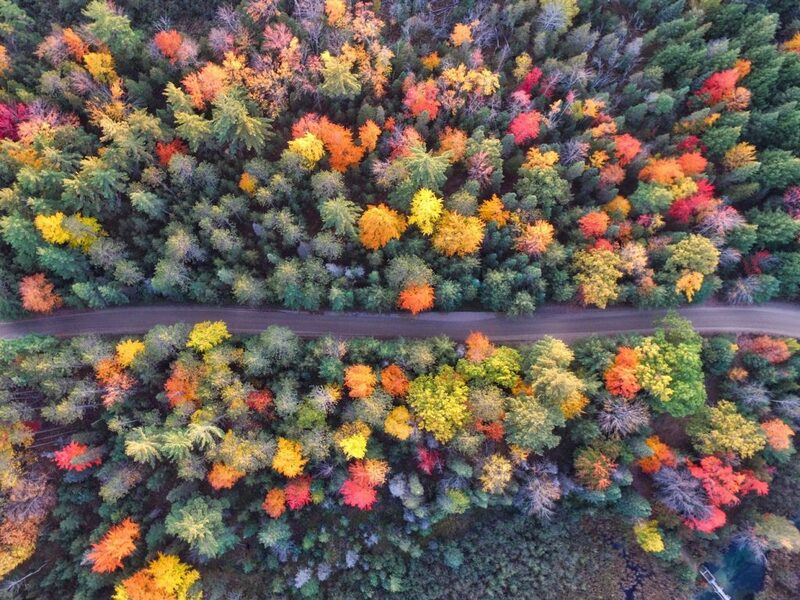 There are also plenty of other great things to do including the festive Great Colour Adventure held at the Mont-Sainte-Anne ski-resort outside of town (you might need a rental car to reach it) in September and October with pumpkin hunts, Oktoberfest, kids races, bouncy castles, mountain biking, and plenty more. Great for friends, families and couple who want to enjoy the fall colors. And if you love event’s, why not consider any of the hundreds of events taking place in Ottawa every year. Plus so, so, so many things to do. Through-out the month of October ghosts and mysterious characters take over the Plains of Abraham with plenty of Halloween events for the young (and young at heart) taking place though-out the day and night. For the more cultured the world-class Quebec City Film Festival takes place every year in September as well. There are hundreds more events going on in fall in Quebec – big & small – so be sure to check with your hotel in Quebec City at check-in! Getting to Quebec City in Canada: All flights are into Jean-Lesage International Airport which is very small but well organized and modern. Bizarrely there is no public transport to or from the airport (minus one bus for staff early in the morning and late at night) so your best bet is to take a ride-share car, cheaper and endorsed by the airport, or a taxi which should be around $35-$40 CAD with a fixed rate. 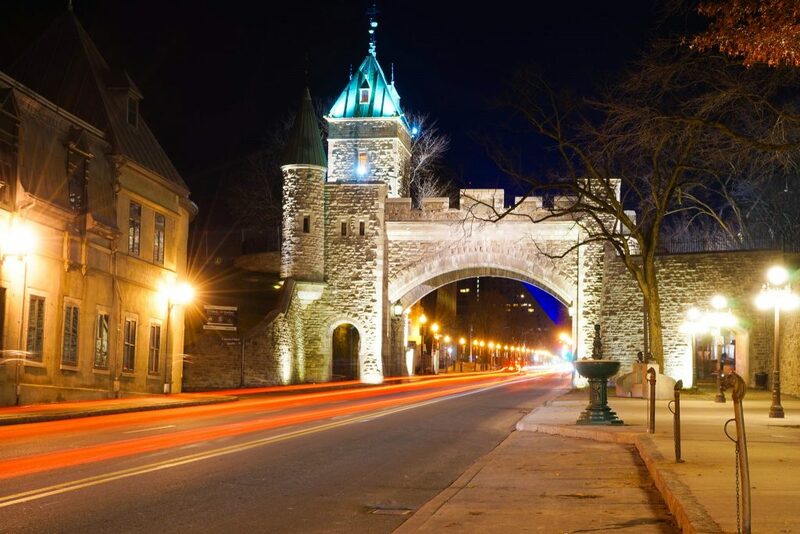 You could also save yourself some time and money if you are going to be exploring more than the Quebec Old Town with a Quebec City Airport car rental. There is also multiple trains daily from the beautiful Gare-du-Palais which is a short 15-minute up-hill walk to the old-town. Check with Via Canada in advance for best ticket prices. 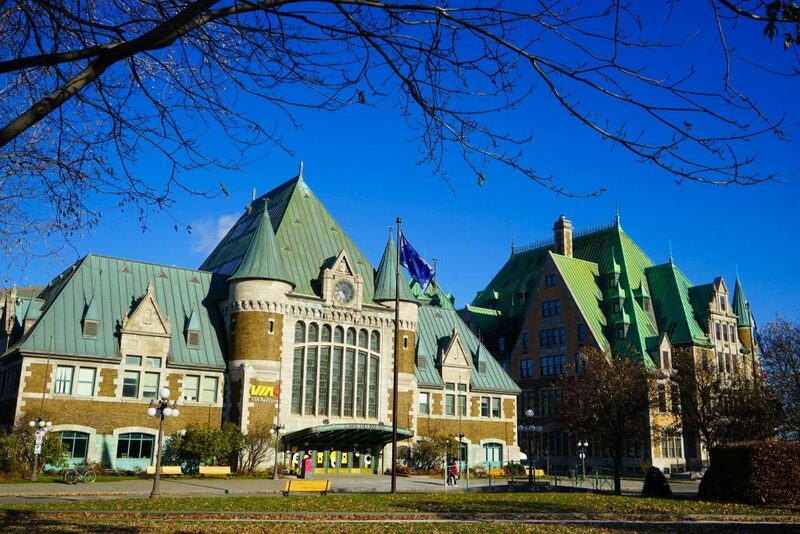 Hotels in Quebec City in Fall are unlikely to sell out, but you will always find the best deals on Quebec Hotels by booking in advance and online. Most can be canceled if things change. Take a look now at some of the best deals on hotels over your dates.